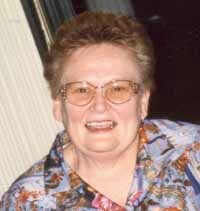 Joann C. Kuhn, 66, of Breese died Saturday January 10, 2004 in St. Elizabeth Hospital Belleville. She was member of St. Dominic Church Breese and the Breese American Legion Post 252 Auxiliary. She worked for 37 years at Wunderlich Fiber Box in St. Louis. She is survived by a niece Stacey Varel and a nephew Chad (Fiancée Anna Schmeink) Kuhn and great niece Sadie Varel and a sister in law Sandy Deien all of Breese. Funeral services will be held Wednesday Jan 14 2004, 10 AM at St. Dominic Church Breese. Interment St. Dominic St Augustine Cemetery Breese. Friends may call at the Moss Funeral Home in Breese Tuesday from 4 to 9 PM and Wednesday from 8 to 9:45 AM. Breese American Legion Auxiliary services will be held at 7 PM Tuesday at the Funeral Home.